What Lexie Loves: Food Revolution Day - and a recipe! Food Revolution Day - and a recipe! Happy Food Revolution Day today! Yes, today is the day which celebrates super simple and healthy meals for all! Food Revolution Day was created by worldwide famous chef: Jamie Oliver, after the levels of obesity and overweightness were rising in the country. He aims to keep the whole world happy and healthy with their food, so the day was created in order to control these figures. 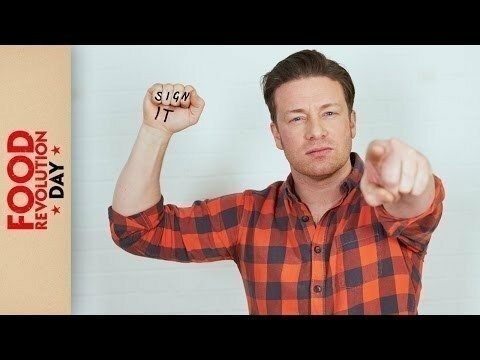 Jamie Oliver has created an online petition which you can sign here. So far they have gathered over 1,180,655 supporters, but every millesecond these numbers are rising. If you believe in beating obesity, then go and sign this pledge yourself! All it is, is not having takeaways and ready mades every day. Just cooking your own version, can really transform lives! The official video for Food Revolution Day! 1. Preheat the oven to 180 degrees Celsius (fan), 200 degrees Celsius, gas mark 6. In a frying pan, fry the onion in the oil till translucent. 2. Add the diced chicken and fry, browning them for 5 minutes. Then, add the garlic and oregano and fry for 1 - 2 minutes before pouring in tomatoes. Let it gently bubble for another 5 minutes. 3. Pop the lot into an ovenproof dish and top it first with the mozzarella and then the pepperoni. 4. Bake for 25 minutes and season and enjoy! I haven't actually tried this yet, but it sounds like an awesome take on a pizza! Let me know if you try it out! So, the anwer to Food Revolution Day is simple: cut down on takeaways and ready-made meals and start self-cooking. To spread the news, sign it and share it!